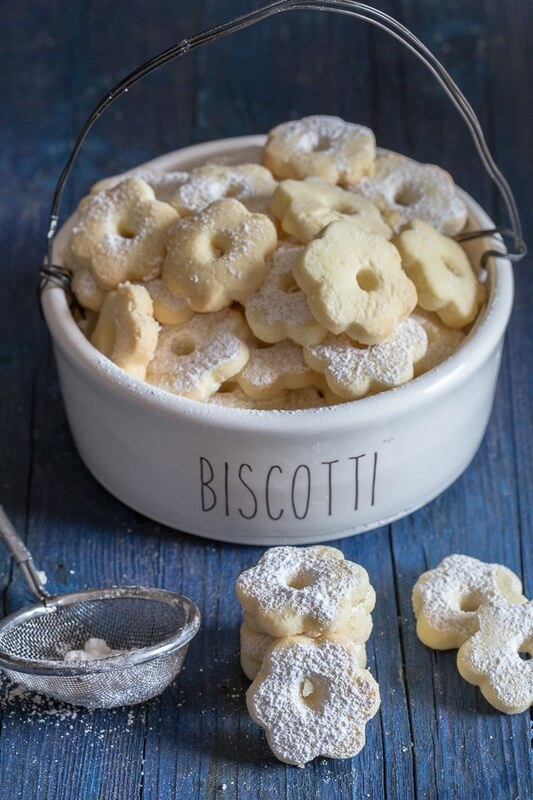 Canestrelli are a wonderfully delicious Italian Cookie, an almost shortbread type cookie but with a crunch, fast and easy. The perfect afternoon tea cookie. A touch of Lemon makes them irresistible. I have returned to Italy and of course I am missing all my family and friends, especially my eldest Daughter that unfortunately I didn’t see nearly enough. She is off on adventures of her own and is now living in Vancouver (this was 2 years ago and now she is back in Toronto!) for the time being. So we only had a few days together. Although we did have a great time and now we look forward to her visit back home. Naturally with the return to your home that was mainly kept up by the Italian, well you can imagine what I came home to! To tell the truth it wasn’t as bad as I had imagined. At least the dog, the cat and the plants were still alive. Needless to say I have a to do list the length of my arm, starting with grocery shopping. So while I was shopping I of course noticed the difference between Canadian aisles and the Italian store aisles. Yeah big difference. While checking out the cookie aisle (believe me that aisle kept me staring forever in Canada) I noticed how unstuffed the cookies tend to be here. The lack of cream, chocolate, caramel, marshmallows etc. 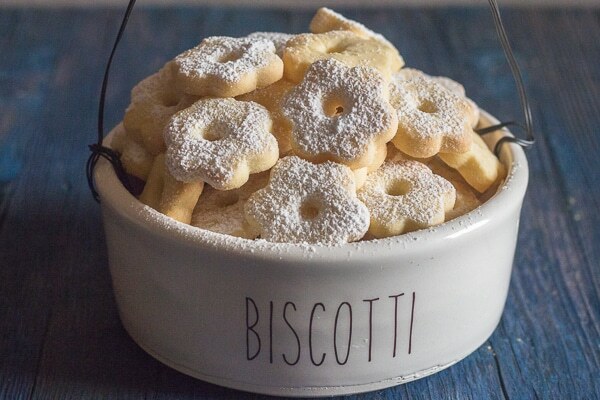 The very basic cookie, from breakfast cookies to snack cookies with this delicious Canestrelli front and centre. These cookies are sold year round but are very popular at Christmas. And yeah I actually like the basic ones better. Because sometimes less is more! I decided to make these Canestrelli, which are one of my favourites! This is a simple crunchy but an almost melt in your mouth cookie delight. The dough comes together in minutes especially if you use your Food Processor. What are the ingredients in Canestrelli? 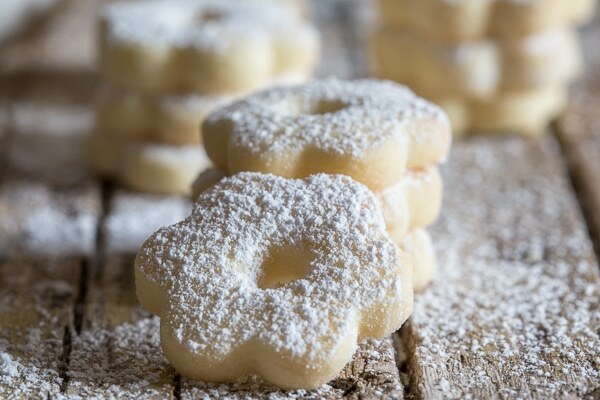 They are made with butter, powdered sugar and hard-boiled egg yolks. Yes that’s right, egg yolks, strange right? That’s what I thought, but I was told this helps make them crumbly, which is what we want. Canestrelli are originally from Monferrato which is in the region of Piedmont in Northern Italy. 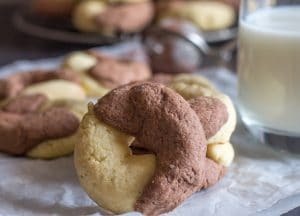 If you are looking for a tasty, yummy Italian Cookie why not give these a try. Perfect with a cup of tea or coffee or just when you want a cookie. Enjoy! Cookies should be kept in an airtight container for up to 2 weeks, or freeze for up to 3 months. 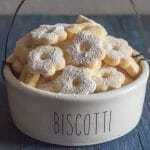 I love my Biscotti handmade bowl from Nelle Design! 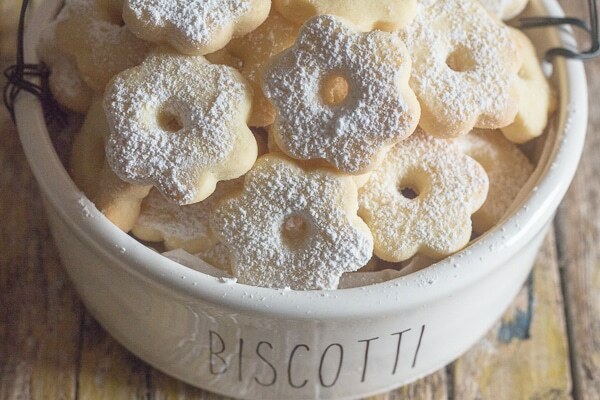 Canestrelli a wonderfully delicious Italian Cookie, an almost shortbread type cookie but with a crunch, fast and easy. The perfect afternoon tea cookie. Place eggs in a pot and cover with cold water, heat until boiling, then remove from heat and let sit 8-10 minutes. Place under cold water. Remove shell when cooled and mash well with a fork. 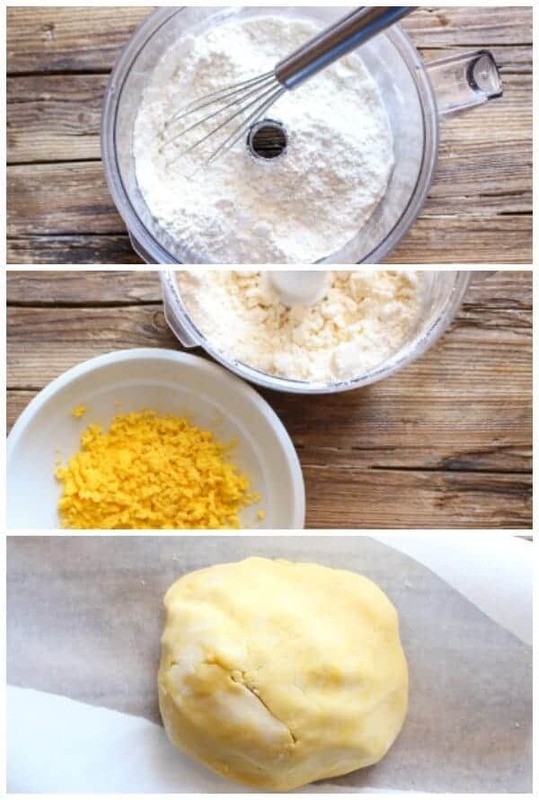 In a food processor whisk together flour, sugar, salt, corn starch and zest, then add cold butter and vanilla, pulse a few times to mix, add egg yolks and pulse until almost combined, move to a lightly floured flat surface and knead gently until combined. Wrap in plastic wrap or parchment paper and refrigerate for at least an hour or two or even overnight. Pre-heat oven to 335° (170° celsius). Line 2 cookie sheets with parchment paper. 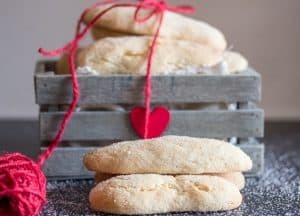 Remove dough from fridge, on a lightly floured flat surface, start with rolling out half the dough to 1 centimeter thickness and cut with a small to medium size flower cookie cutter, using a straw or any small round hole cutter**, cut a hole in the middle of the flower. Place cut out flowers on prepared cookie sheets and bake for approximately 12 -14 minutes, cookies should not brown. Let cookies rest 5 minutes then move to wire racks to cool, then dust with powdered sugar. Enjoy! **I used a small pastry tip. Updated from September 2, 2016. Can the flour be replaced with GF Jules all purpose gluten free flour? And also can tapioca flour replace the corn starch. 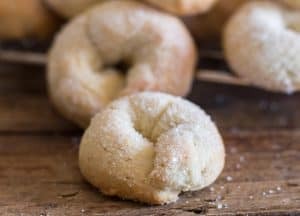 Hi Becky, I have never made these with GF flour or tapioca, you could try it and see how it goes. Let me know if you do. Just mixed up and got it pulled together and in fridge. Recipe says old butter. Your idea looks like it is almost melted butter. That would make it easier to pull it together. It took awhile but I got it into a piece and shaped so I pull hill it. So is it old butter or really soft butter. Thank you! Lol…yes cold butter! My iPad had water and c didn’t work! Hi Rosanne, oh ok lol, the butter probably wasn’t extremely cold but you can use either, (not too soft though), it will all work in together. Hope that helps. Have a great weekend. Hi Abby, interesting. I would go for 325 then, because the cookies need to bake in a slow oven. Let me know how it goes. Have a great weekend. Hi, do you know if the recipe works if you add in something extra like maybe some crushed nuts or chocolate nibs? Hi Anna, I have never added anything to the recipe, but I think it would work, just don’t add too many and make sure the pieces are small. Let me know how it goes. Hello! I cannot find a canestrelli cookie cutter ! Do you know where where I may purchase one? I’ve looked on Amazon but not sure where else to look! Many thanks!! Hi Jane, I just use a small flower cookie cutter and with the tip of a straw or large piping tube make a hole in the middle. Hope this helps. hi! i have a question, the butter is unsalted right? Hi Isis, no the butter is always salted that I use, because I can never find unsalted in Italy. 3/4 cup cornstarch? That’s a lot! As a non-baker it’s hard to fathom. HI Cathy It may sound like s lot but that’s the recipe. Corn starch makes these cookies tender and melt in your mouth. It does work, I have been making them for quite awhile now. Hi, I just made these cookies… they are delicious!! Thank you so much for the recepie. I baked half of the dough and froze the rest. My son and My granddaughters were here while I was baking them and needless to say, all the cookies are gone. Hi Ileana thanks so much, so glad you all enjoyed them. And good idea about freezing the dough. Have a great idea. I love these, they are simply delicious. My family loves them too. I also love the little bowl you have them in. Any clue where to find one of those? Thanks in advance and for this wonderful recipe. Dough resting in the fridge!!! Can’t wait to try them!! Thanks for the recipe. Hi Angela, hope you enjoy them. Let me know. Who knew that hard boiled egg yolks would make a crumbly cookie. Not me, but makes sense. These cookies look amazing. I seriously can’t wait to make them. I’m printing your recipe right now! Thanks! Hi Renee, thanks hope you enjoy them, let me know! These are so sweet! So looking forward to following you and hearing more about Italy! Hi Lane & Holly, thanks so much, I hope you enjoy my tales of Italy! These cookies are bringing me back to my childhood! Hi Sherrie, ahh so glad. Have a great weekend. These look so wonderful! 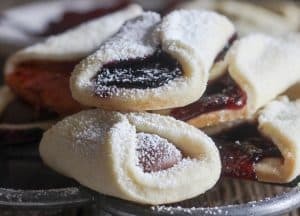 Love these and love Italian cookies. Thanks Karen, hope you enjoy them! Hard boiled egg yolks?! How utterly unusual. I’m intrigued. I love the idea of something fairly simple and homey as a way to settle in being back home. Hi Kirsten haha I know about the hard boiled eggs! Have a great weekend. These are the prettiest little cookies! I’m surprised at the hard boiled egg yolks and really want to give it a try. This is the most interesting cookie recipe I’ve seen. But, knowing your delicious cooking, these are amazing! Ahh thanks Renee you are always so kind.